You are running a small home needs shop named “H Group Home Needs”. So as a shop owner, you buy items from some big seller and stock it in your shop. Now people come to your shop buy stuff from your shop. The big seller from whom you buy stock is called as Vendor or Supplier (Vendors are define in the Purchasing Module), the people who come to your shop to buy things are known as customers (Customer are define in the Receivable Module), the stock in your shop is known as inventory. Later your business expands and now you take orders over the phone and provide service to deliver the items to your customers, so you hire people to help you out in maintaining the inventory. The people you hire are known as Employees. Employees are define in the HRMS Module. In this small shop, it is difficult to manage the bookkeeping activities by hand using a notepad or like that. Now you can imagine the same setup on a larger scale where you have more than 1, 00,000 customers, have more than 1000 vendors, have more than 1000 employees and have a huge warehouse to maintain your inventory. Now, it is impossible to manage all that information using pen and paper. To overcome this problems in large businesses, companies like Oracle Corporation have created huge software known in the category of ERP (Enterprise Resource Planning) as Oracle Applications. 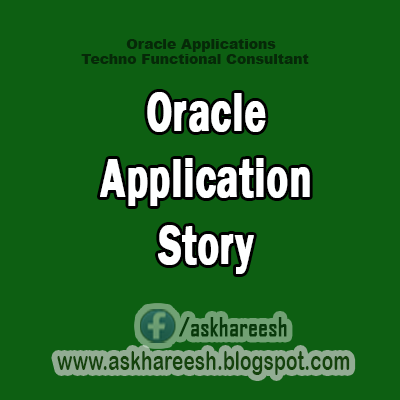 Oracle Application is not only a huge software, also the collection of software known as modules (GL, PO, AP, AR or FA etc). Let us identify the modules by entities. For e.g. Purchasing and Account Payables deal with the vendors since you purchase from vendors and eventually have to pay the dues. Oracle Purchasing handles all the requisitions and purchase orders to the vendors. Oracle Receivables and Order Management deals with customers. Order Management helps to collect all the information that your customer is ordering over the phone or web store etc. Receivables helps to collect the money for the orders that are delivered to the customers. Oracle Human Resources manages the pay checks of employees. Oracle Fixed Assets manages Assets like all the equipment, shops, warehouses, computers. Oracle General Ledger module receives information from all the different transaction modules and summarizes them in order to help you create profit and loss statements, reports for paying Taxes etc. when you pay your employees that payment is reported back to General Ledgers as cost i.e. money going out. when you purchase inventory items the information is transferred to GL as money going out, and so is the case when you pay your vendors. When you receive items in your inventory it is transferred to GL as money coming in. When your customer sends payment it is transferred to GL as money coming in. So all the different transaction modules report to GL (General Ledger) as either “money going in” or “money going out”, the net result will tell you if you are making a profit or loss.